I love vinegar! Salt and vinegar chips, fish and chips with malt vinegar, red wine vinegar on a simple tomato and lettuce salad. It is one of my favorite flavor profiles. But I have discovered (though apparently long well known) that vinegar is an amazing cleaning agent! For the last ten years, (yes I am really that slow on the up take) we have been dealing with hard water. As renters, we never rented a place with a water softener. On top of that, I don’t like how softened water feels. Most things weren’t that big of a deal. One appliance was. The Dishwasher!!! Not only was the mineral build up hard on the machine, making it less than efficient at getting the dishes clean, the hard water stains on my dishes were an eyesore and an embarrassment. I spent a decade scrubbing the crap out of dishes, cups , and pots and pans. Frequently I would get so fed up I would just throw them away. Stupid really, but sometimes you hit that point of frustration where all logic escapes you. I tried all the spot free, rinse aid, hard water defeating products on the market. There was some improvement, but only with dishes that were not yet infected with the white crust of the hard water plague. So once a dish was infected, it was a downhill spiral, inevitably ending in another poor dish ending up in the trash. But not anymore! 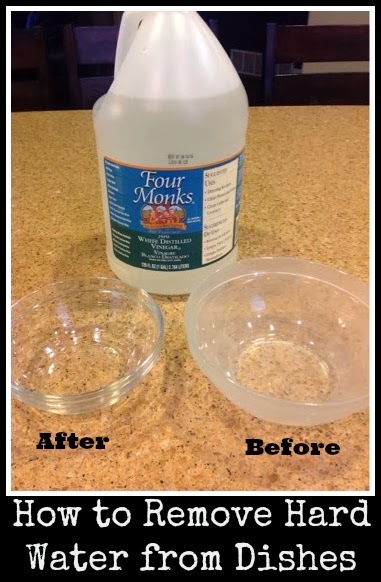 The other day I found that by adding a cup or two of regular distilled white vinegar to the dish washer and my normal detergent, even my most infected dishes came out shining and glistening as if they were brand new! And on top of that, my dishwasher looks less and less like a salt mine with each wash. Once the water is filling up, open the door, throw one or two cups in the bottom and let the magic happen! No scrubbing! 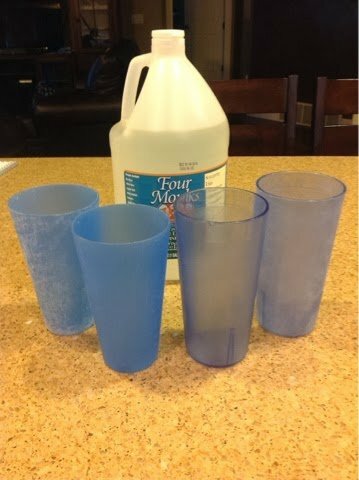 To maintain the stain free dishes, a half a cup should do it.